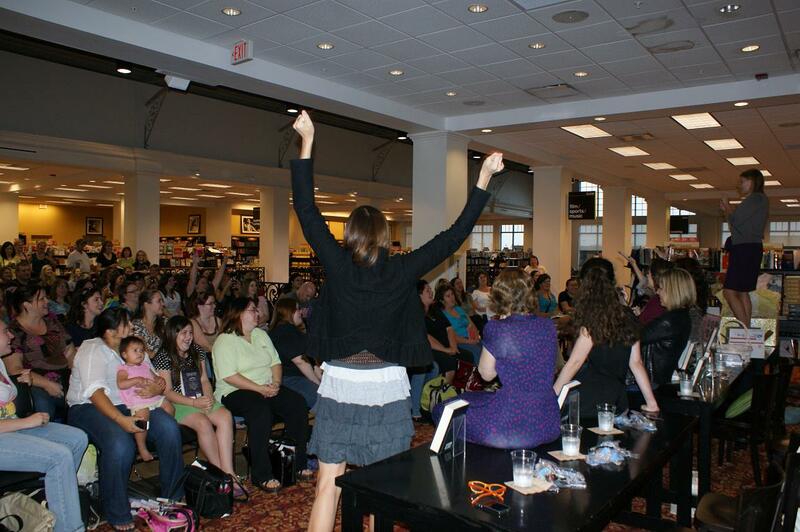 It all started in early spring when the Smart Chicks Kick It Tour was announced and three girls made a pact. Those three girls were Kristi from The Story Siren, Chelsea from The Page Flipper, and myself. The deal was that we would go to the Dayton, Ohio ands Cincinnati, Ohio stops of the tour. Long story short, the pact broke down a matter of weeks before the event but that did little to deter me. Kristi and I were still on for Dayton so we planned on staying together, and I found out last minute that Chelsea would be in Cinci. The problem was I had nowhere to stay, so I thought Dayton would be it for me. One stop is better than none, right? 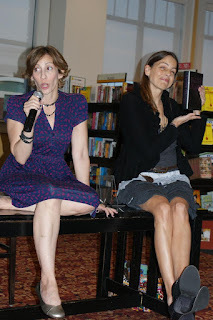 The Story Siren, Kristina McBride, and me. I got on the road at the crack of "Oh my god, why am I awake" that Thursday and headed west to Ohio. West Virginia was ueventful as usual until my GPS lied to me. Big surprise. You'll recall it tried to drive me off a bridge into a river in Kentucky not long ago. This time, however, it told me that I needed to go went then northeast, back-tracking into Ohio. I ignored it and took a road that I vaguely recalled seeing on Google when I looked up directions, Route 35. Before I turned off the GPS said 4 hours 50-some minutes. After I turned off the highway it dropped to less than 4 hours. What's the lesson? GPS ladies lie! Route 35 is potentially the weirdest road I've ever been on. In WV it's a freeway. As you cross into Ohio it becomes a two-lane farm road lined with silos and cattle. A hundred miles from Dayton it becomes a freeway again, but then becomes a regular road complete with stoplights on the outskirts of the city. I arrived later in the afternoon, and Kristi humored me by getting lunch with me. From there we hung out at the hotel until the signing at Books & Company. 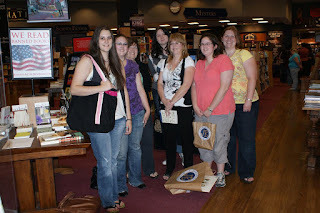 We arrived well before the signing was scheduled to start and there was already a line! Minutes before the event started Kami Garcia, co-author of Beautiful Creatures and Beautiful Darkness, drafted me as the official photographer. 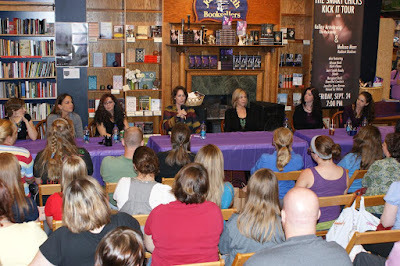 The Smart Chicks talked about their books and answered questions before signing. I also kept getting oddly emotional photos of Jen. I have no explanation for this. Kami talks while Margie does her best Vana impression. 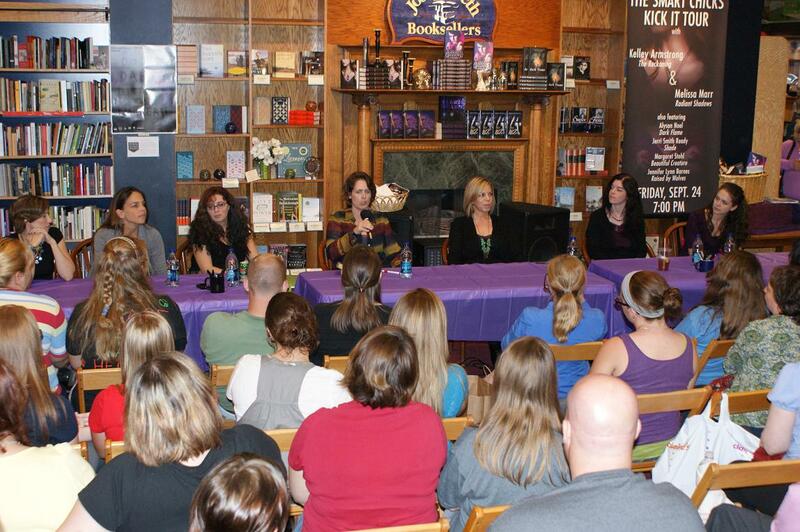 The Smart Chicks sign a whole lot of books. Once the signing was done, Kristi, Kristina, and I headed to Cheesecake Factory to eat decadent things. We were joined by Jackson Pearce who was waiting for her cab and had a lovely late dinner. Afterwards, Kristi and I headed back to the hotel to get some shut eye before we parted ways. If you follow me on Twitter, you might know what happened the next morning, but I'm going to tell it anyway. Kristi got up early and I was still snoozing. Unbeknowst to me, Kristi packed up her toothbrush AND mine. Why? Because they had the same color handle I guess. She was already flying down the highway by the time I noticed around 11a.m., so I was forced to go to Walmart and buy a new one so folks in Cinci wouldn't run screaming. Everyone except Koriann and Mara. Somehow they escaped the camera. I headed south shortly after my pitstop and arrived in Cinci near 2pm. To waste time I got a hair cut and ate a late lunch/early dinner. Then I met up with Mara, Chelsea, Bri from Bri Meets Books, Lauren from Shooting Stars Mag, Koriann (@FoodIsAwesome), and Linda Gerber, author of Trance, at Bronte's for coffee/dessert. I ordered Fruits of the Forest pie, and everything went downhill from there. The pie was delicious, but the waiter, Jacob, and I began throwing light-hearted jabs and when the bills came he held out my folder and said "Fruits of the Forest pie." I responded with, "I see. I will forever be known by my pie here." That got a great smile out of Jacob, and Chelsea was sure there would be a number on my receipt, but alas it was not to be. The joe did live on though. For the remainder of the night people were saying, "Susan's pie is famous in Cincinnati." 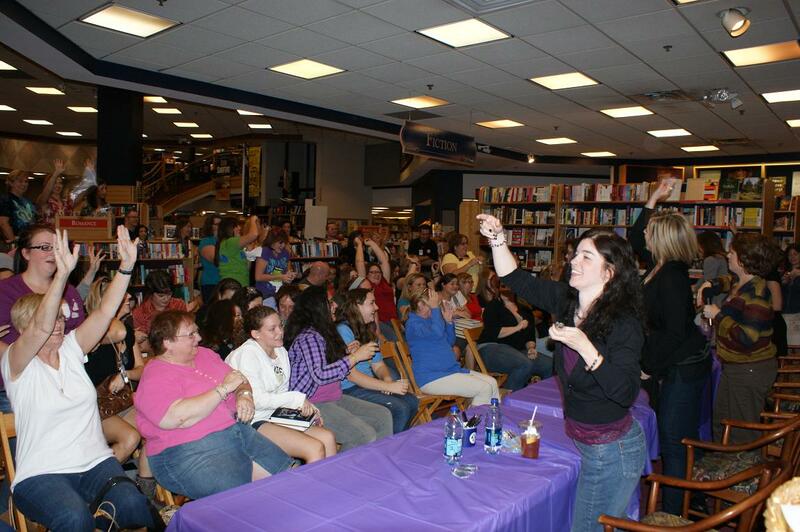 Then came the signing at Joseph Beth Booksellers. At this stop the crew was mostly the same. Jackson Pearce left and Jeri Smith-Ready, author of Shade, joined the party. Smart Chicks at the signing table. Jeri and the Smart Chicks throwing swag. Kami signs an awesome T-shirt. No funny stuff this giveaway. Winner takes all. Contest is for U.S./Canada only and will end at 11:59p.m. EST on December 11. Just fill out the FORM to throw your name in! Oh my gosh! 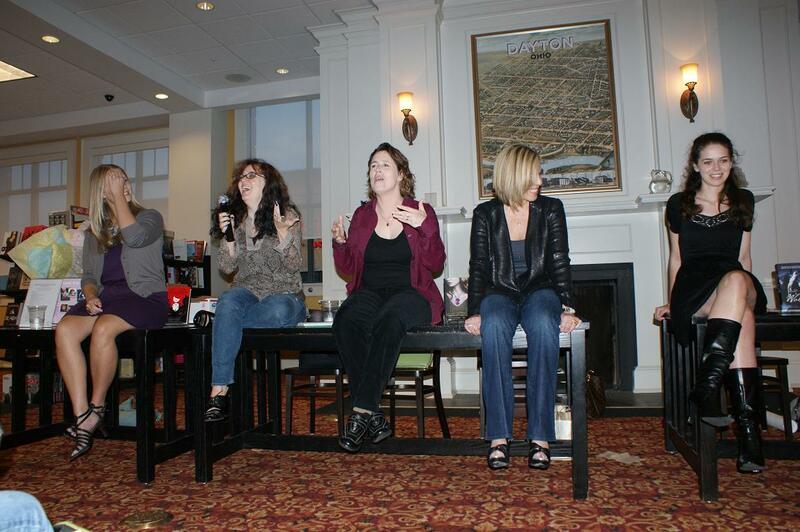 I loved Smart Chicks Kick it, and I was AT the Cincinnati one at Joseph Beth. I wish I woulda known one of my favorite bloggers made the trek out! I was planning on attending the Dayton one too, but unfortunately I was too broke to get the books.. Darn it! I love Smart Chicks. These authors are incredible and inspirational. Thanks for sharing the awesome/ funny pictures and experiences. 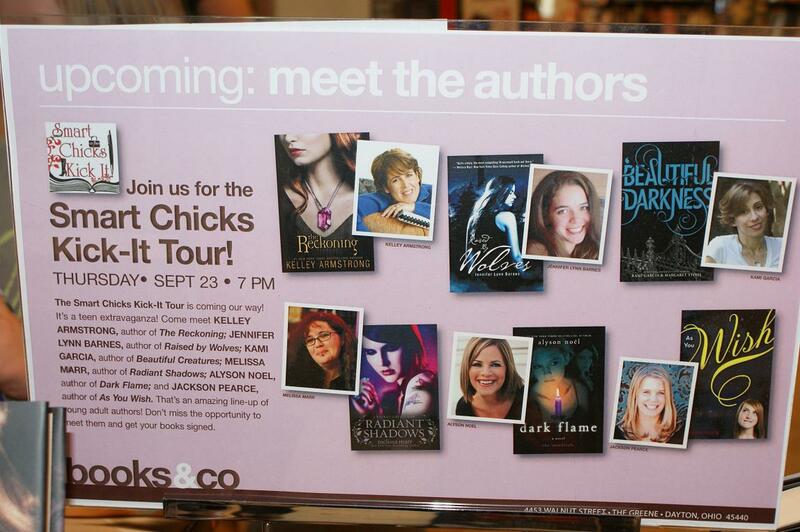 I am living vicariously through you, as these Chicks will not be coming anywhere near the Western Mountains of Maine! Darn. That is one insane prize pack xD I'm glad you had tons of fun! I wish they were coming near me! What fun!! 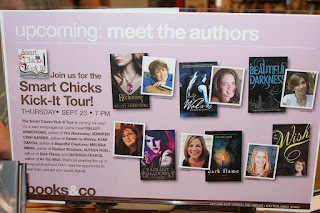 I love reading about author events, and this is one tour I really wanted to go to but sadly wasn't able. And you are beyond awesome for offering up such a loot! Thank you! That breakfast we had the next day was fun, too! So nice to meet you! What an adventure! I wish I could have been there too. Thanks for this extremely generous giveaway! I really wish I lived in Ohio right now. Sounds like you had a great time. Road trips are the best even though I usually get lost at least once in the way. This is such a great giveaway. I tried to convince my brother-in-law to go when they were in San Diego, but since I wasn't with him, he wasn't having any of it! Oh i so wish I could've been there! Sounds like an awesome time!! Loved reading this recap. I really wish I could've gone. Hopefully if they do it again, there will be a closer stop for me, lol.